We are extremely proud of our herd of Guernsey cows. Each one has a name and is registered with the American Guernsey Association. Guernseys are the most "dairy" of all cows, so if you don't see their ribs, they are too fat! We have a small herd of Guernsey cows. Checkout this video for a great overview of our farm. 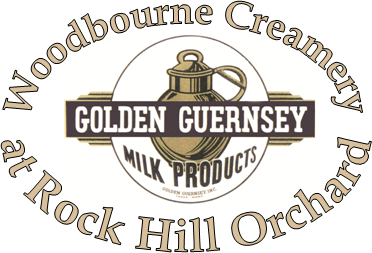 We use the American Guernsey Association trademarked "Golden Guernsey" logo as we are proud to be carrying on the tradition of supplying golden creamline milk. The Guernsey cow is descended from cows on the isle of Guernsey in the English channel. She is one of the most efficient breeds at converting grass into milk. She is a medium-sized and very docile cow (ours especially due to their handling as calves). Guernsey milk contains 12% more protein, 30% more cream, 33% more vitamin D, 25% more vitamin A and 15% more calcium than average milk. The golden color of the milk is due to the beta carotene not being broken down (as it is in other breeds). Guernseys have a higher level of Omega-3 than other cows. Our cows are on pasture 24x7, 365 days of the year as we are firm believers in utilizing managed intensive grazing because it provides an avenue for farm environmental and economic sustainability. It uses high stock density, short duration grazing to manage forage production efficiency. Animal nutrient demand through the grazing season is balanced with forage supply and available forage is allocated based on animal requirements.